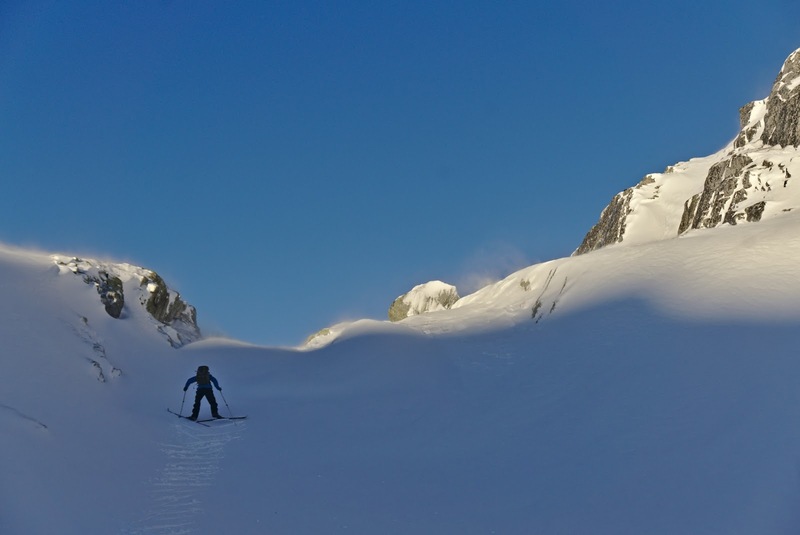 Early season skiing is always a bit of a gamble. 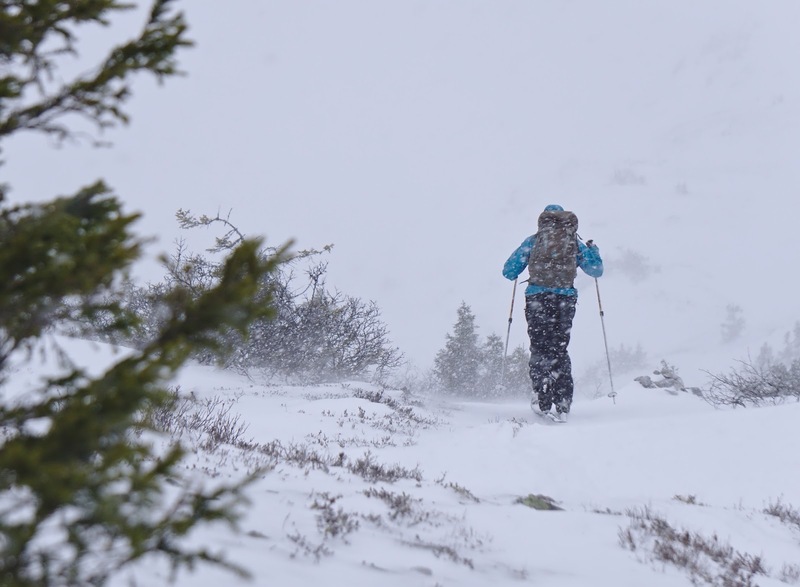 You can peruse weather forecast and snow maps for as long as you like, but at some point you have to go out there and check it out for yourself. 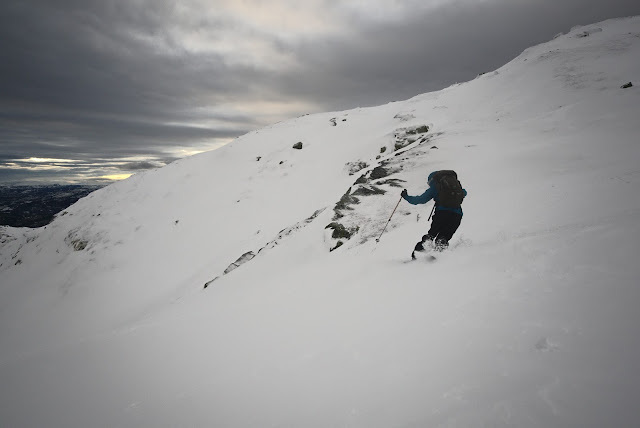 So it was that Audun and I headed to Blefjell, 2 hours outside of Oslo, for the first weekend of December. We were cautiously optimistic, but decided not to have too ambitious a goal for the day in case the conditions were adverse. It was a grey morning, with animated cloud cover and the sun glowing like an ember on the horizon. We followed the vague imprint of a summer trail through the forest, then turned uphill towards the mountains. Exposed clumps of blueberry and heather peaked out of the marginal snow cover. We had gambled, and the snow was not the best, but at least it was a beautiful day in a beautiful place. Gradually, the wind picked up and it began to snow in big, sticky clumps. I bundled into my hood and ski goggles, starting to feel like a polar explorer in this tiny wilderness not really all that far from civilization. The second half of our ski to Sigridsbu was downright nasty. We could barely hear each other over the wind, and the blowing snow stung my face. I was glad we didn't have to ski too far to get to the safety of the cabin. Audun heads into the vortex. We arrived at the hut around lunchtime, and stoked the fire and snacked for a while. I grew restless, and discovering that the wind had calmed a bit, suggested a foray to a nearby peak. Unbeknownst to us, a supermoon rose and lit up the landscape, almost brighter than the weak December sun. After peaking out the cabin window, I insisted we walk around to check it out. The landscape was illuminated in black and white, and if it weren't for the persistent wind I would have requested on a longer foray. As it was there was something magical about being out under that moon. 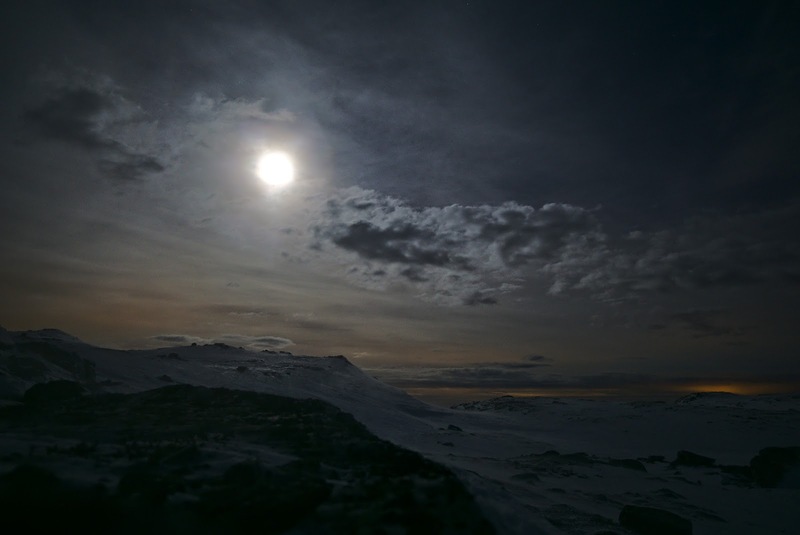 The moon over Blefjell. The picture doesn't quite capture it - some things you have to experience for yourself! The next day dawned sunny but windy. 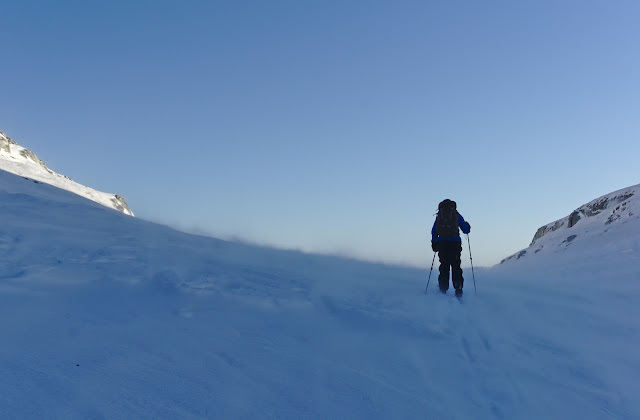 Despite the wind, we decided to climb Store Ble, the largest peak in the area, and make a larger half circle back to the car. Making tracks into the wind. The wind was persistent and strong, and we were bundled into our hoods nearly all day. We only afforded a short stop on top of Store Ble, the windiest point in the area, before continuing on. It looks like a beautiful sunny day, but the photo doesn't do the wind justice. We followed some old ski tracks through the other desolate mountains. The wind had inverted them in places. The landscape around us was marred with sastrugi, like a frozen ocean desperately trying to lick some distance shore. After a short lunch break, my hands froze, and I had to put on my big mittens. It seemed strange to be bundled up on such a beautiful day, but the wind sucked all the warmth out of us. Wind swirls around my feet. 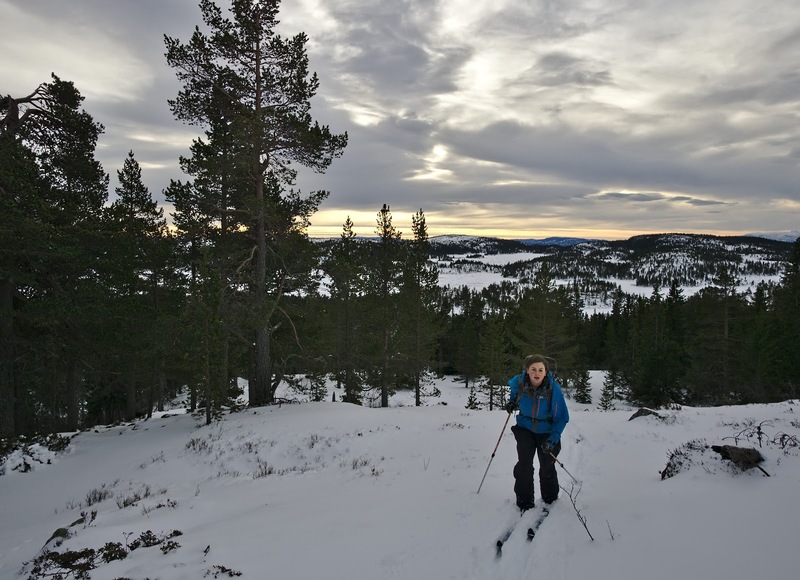 We descended from the mountain to a tree-covered plain that we hoped would afford easy skiing back to the car. We were wrong. We spent the afternoon bush-whacking through tightly-grown birch and spruce forest, while sinking in to sugary snow that lay under a nice frozen crust. I grew so frustrated that I declared this the worst ski adventure ever. I have since changed my mind. Audun leads the way through the Forest of Fun. Not. Strava here, here and here.